I like to get various electrical wires, strip them down to the copper and twist them into shapes - the thicker gauges forming the trunk and finer and finer gauges for the branches. The finer gauge can be twisted onto the heavier and shaped like a fish skeleton similar to tree branches. Look at the skeletal layout of a leaf and you'll notice it's similar in shape to the tree in a lot of cases. Make the base heavier to balance the tree. Then you need a good fixative that is not really runny. If you have twisted the copper together it makes for better purchase and for interesting knots in the tree. 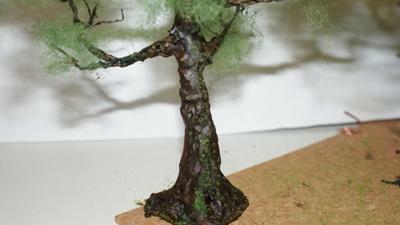 Copper wire trees are especially good for realistic old oak trees. Add some color to your fixative and make about three shades minimum - dark for the base, leading to a more tan color for the main branches and then off to a tan or green tint to the newer branches. Light netting as from the Hornby range results in beautiful light-weight foliage, and if you add any extra texture fix it with hairspray (flammable I know but very effective). Use an open window if doing more than one tree. Finally glue at the base a little texture to imitate lichen or ivy. If desired there are also small bird models which look fantastic, especially with a little nest - although the smaller the bird and nest the better. You can hang a bird from cotton thread - paint the cotton in the colors of the tree making it less conspicuous. Cats can be added, and the branch is malleable enough to make this look realistic.